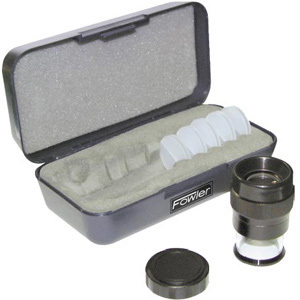 Fowler’s Pocket Optical Comparator magnifies images which are sharp, undistorted and free of aberrations. Convenient for checking angles, thread measurements, hole sizes and more. This 7X comparator is widely used by machinists, toolmakers and inspectors in the industry. 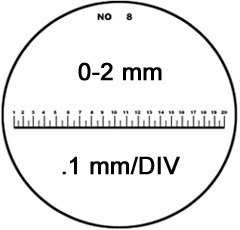 Scales are photo-etched into a glass reticle which is placed in actual contact with the measured object, thus obtaining simultaneous enlarged images of the scale. Used also as a highgrade magnifier. 13 types of reticles are available, each packaged in a protective plastic case. Reticles are easily interchanged by a screw-in mount. 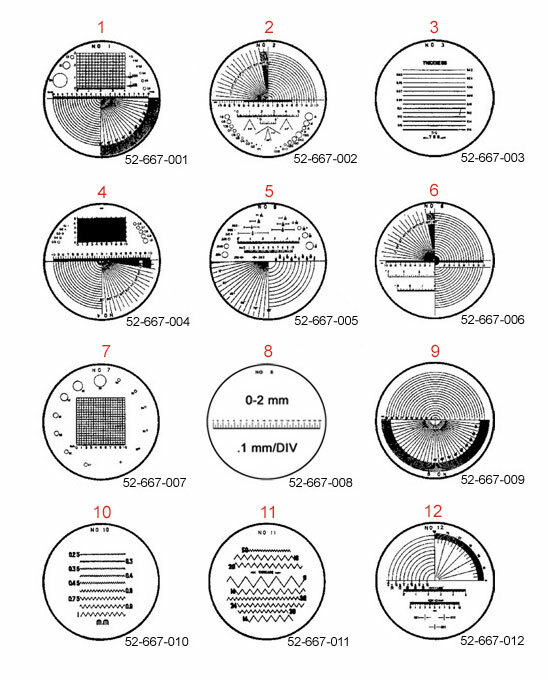 Use them to measure radii, diameters, angles, pitch and thicknesses. With the illuminator attachment, the Comparator converts into a self-contained illuminated measuring magnifier. Reticle 52-667-013 (No. 13 not shown) is similar to 52-667-008 but is in inches. With 0-.8”, .0025”, .005” graduations.